Vari Mu II is a mastering grade compressor, which of course excels in mixing too. Input and output attenuators as well as threshold switches are 23-position Elma rotary switches and the rest are 11 position Elma switches. Knobs are from Elma soft touch series. All signal transformer are Lundahl’s oversized models. 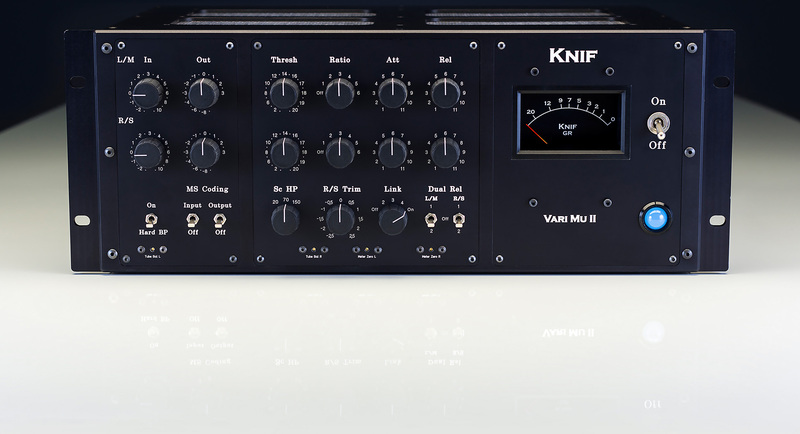 Knif Vari Mu II has an MS-matrix, interesting variable Link and side chain HP filter. Calibration of the compression tube balance is easy with internal signal generator and front panel trimmers. So, how does it sound? Mostly it does not “sound”. That is the whole point. But there seems to be somewhat “enhancing” character, especially with the optional amorphous core transformers. Wide open with a lot of details. This is not the overly “fat and big” tube compressor sound which in fact is too often just messy, woolly and dark sound of bad transformers and too much distortion. I know that the informed mastering engineer appreciates versatility and transparency. And this is what Knif Vari Mu offers. It can be driven into controlled soft clipping if desired but it also offers industry leading transparency when used in a controlled fashion. It is very versatile due to separate input and output trims and a ratio switch. In MS-mode you can fine tune the stereo width according to the compression or your taste. Note that you can not adjust the width with input and output pads, because they are located “outside” the coding and hence work in normal stereo mode. MS-coders can be switched on independently to make the compressor to work as an MS-coding or decoding device in the signal chain. To my regret dual needle meter is no more manufactured and getting increasingly difficult to get, and most of the time not available.